This page is your gateway for information on world financial markets. Included are World Stock Market, Indices Futures, Commodities and Financial Futures. You can customize the page by region, country or specific index with the dropdown, tabs and relevant buttons displayed. 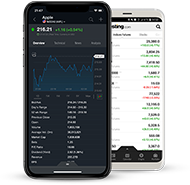 Using the tabs provided you can find information about the Forex, Options, Futures and Bond Markets and Stock Market as well. Use the buttons, if relevant, to customize for index.